I cannot stop making hammers. This is a hammer head made of UHMW plastic. That is ‘Ultra High Molecular Weight’ plastic. It is incredibly abrasion resistant, and pretty cool to boot… The handle is cherry. 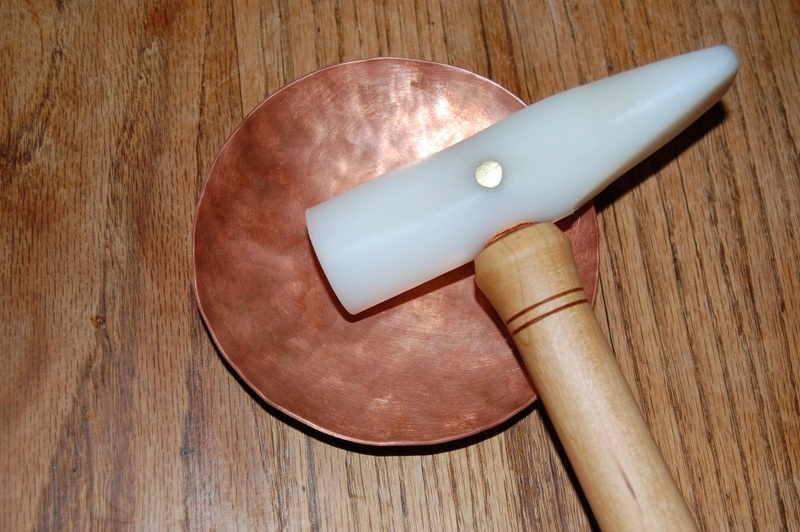 It should be a good non-marring hammer for me to use in raising this copper vessel. Making a hammer is the most primal amazing feat of tool making. Hammers are a magical thing. Once you have a hammer, you can make all the other tools. In the past, blacksmiths would break off a piece of their hammer and forge it into their sons first hammer when he began his apprenticeship. As for me, a tiny brass hammer that my grandfather made is one of my prize possessions – a rosebud if you will. I made this hammer as a copy of one that my metals instructor, Bryan Park, had made. This entry was posted on July 2, 2010 at 2:30 am and is filed under metalwork, Raising Copper, Tool Making. You can follow any responses to this entry through the RSS 2.0 feed. You can leave a response, or trackback from your own site. Awsome hammer, dude. I love making stuff with my hands too.